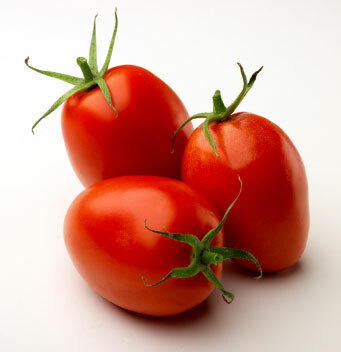 The bright red Roma tomato, is a very popular open-pollinated plum variety that is commonly available in retail groceries. It is a determinate type tomato vine and stops growing after it reaches a height of 3- to 4-feet. Because its vines are easier to manage than indeterminates it is a good choice for growing in containers. This variety is popular for canning because it is thick and meaty with few seeds and has a rich flavor. It is also a heavy producer, which is convenient for home canners who need a short harvest period. When choosing varieties, keep in mind that "determinate" tomatoes ripen over 3-4 weeks on bushy vines with thick stems that usually don't need to be staked. Plant Characteristics: Determinate; regular leaf; high yield; 3- to 4-ft.